What do sparrows eat and how to attract them? House sparrow is the most common to be seen next to human settlements. The sparrows eat mostly seed, like Sunflower Seed, and Nyjer Seed , but at some point they are known to eat small insects. 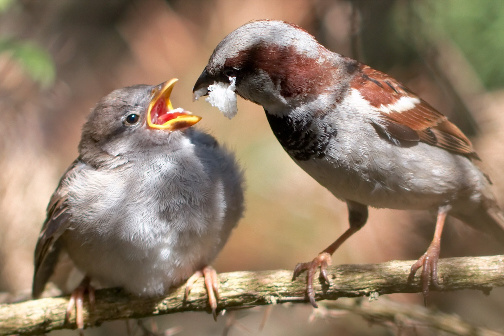 When a breading season start, the sparrow will turn to insects and worms to feed the babies. If you want to feed them at this time you can install the mealworm feeder. This will attract sparrows as well as other song birds like bluebird and chickadees. House sparrow will be seen where ever human settlements can be found, they like and thrive next to humans and will benefit from human houses and buildings. This little bird is so common in our cities and towns, that it is hard to imagine life without them. Lots of artist and poets have dedicated they work to this bird on history, and even if some people resent them, sparrow is just good at adapting to us. This birds are strong defenders of their territory, and will sometime displace other birds from nests, this can be seen by some as an invasive behavior. But in reality these birds are just trying to survive and raise the young. The favorite place where this birds make nests are cavities. Sparrow is a cavity nester and will find holes in human buildings like roofs tops, walls, barns, and nest boxes installed to attract birds. Learn what do sparrows eat. The house sparrow diet is made mostly of bird seed, grains, and will come to bread or other scraps, and insects when raising babies. 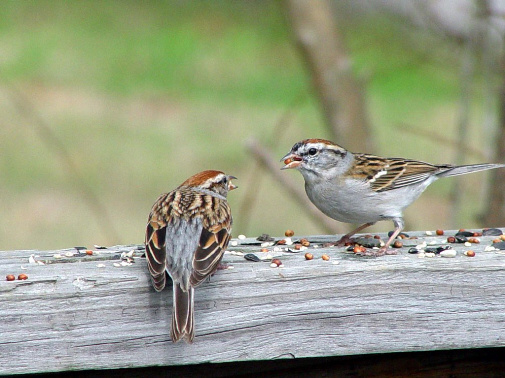 Sparrows will be attracted to bird feeders, and will eat most of the seed like Sunflower Seed and Cracked Corn provided to them, in the wild they will fond crabgrass, buckwheat and other grasses. If you have a bird feeder you will have sparrows visiting together with other birds. What do baby sparrows eat? If you have found a baby sparrow, then please visit the what do baby birds eat sections where you can find great information how to feed baby birds and sparrows. When in breading season, you can easily find baby sparrows on the ground next to roofs, streetlights, houses, barns and other man made buildings. If you find a young sparrow on the grounds without feathers it’s a clear sign that a bird needs help. If the birds in naked, it is still too young and you must try to find the nest in the vicinity. 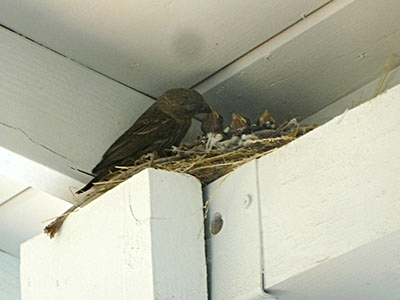 The bird will not fall to far from the nest, and if you find it put it back inside so parents can take care of it. If by chance you cannot find the nest, then if you don’t take care of the bird it will most likely die on its own. If you decide to take the bird, it is important to know what do baby sparrows eat, please read what do baby birds eat article. The little bird will need special care and help to survive. If you need help, please go to the bottom of the page and reach me at the facebook link. I check my facebook daily and will help you. Raising small birds is a hard task and you are advised to ask a wild life center or a veterinarian for help in your town. I hope you liked this what do sparrows eat article and happy birding. If by any chance you found a baby house sparrow on the ground it is important to make sure the bird is abandoned. Baby birds are difficult to raise and often die when a human tries to hand feed them so you should do it after you make sure the birds is an orphan. How do I make sure the bird is abandoned? If the bird is small and without feathers then is has fallen out of its nest. Look around to see where is the nest, sometime you can hear its siblings chirping from the nest. If possible put it back inside, birds will not stop feeding the baby if it was touched. If the bird has feathers then it is probably a fledgling and is best to leave it where it is, parents will continue to feed it. Sparrows are not protected by law and are not endangered so it is safe to keep one while you are feeding it. Most of the baby birds humans find around homes are house sparrow, they use our homes as shelter and often nest under roofs in small cavities. I recommend you get proper baby bird food, but in emergency you can get dog and cat food soaked in water. Cat and dog food are good as they both have high protein content and that is what baby sparrows need to grow. But still if you have the chance get a proper baby bird formula to give the bird the best chance of survival. You can use a syringe or a small tweezers to insert the food in the bird crop. If you use a syringe make sure you get along one so you can insert it deep in the bird mouth and pass the wind pipe. This way the bird will not choke on the food. You can add bird vitamins, insects or boiled egg to the mix, always mix it with water so the bird can get liquids and eat it easily. Please note that earthworms are not good for sparrows, if you want to feed live insects go to the local pet store end get the ones for the reptiles. Dried insects are also great, you can mix them in the cat food or feed them by themselves, these dried insects can be found in pet stores or ordered online just like live ones. Baby birds rarely transfer diseases to humans but you should take measures to protect yourself. Wash your hands after you feed the bird and disinfect the tools you use. Clean the box where you keep he bird from droppings and dirt. Don’t touch the bird at feeding, insert the food and get out of sight, keep the bird in a quiet place away from human contact when not feed. Do your best not to talk to the sparrow, human voice can make them get attached to you and loose fear of humans. Do not give water to baby birds, just mix water in the food and that is all the bird needs. If you force water in their beaks they can easily choke and die. That is one more reason to use a long syringe so you can insert the food deep inside. Keep the baby bird in a warm and quiet place where it will not get harassed by pets or children. If it is summer time a nice box and some straw will do fine. If the bird has no feathers then you can get a heating pad set on low and cover it with some paper towels that you can easily clean when covered in droppings. Heating lamps are ok also but make sure you don’t overheat the bird. The ideal temperature is 85- 90 F.